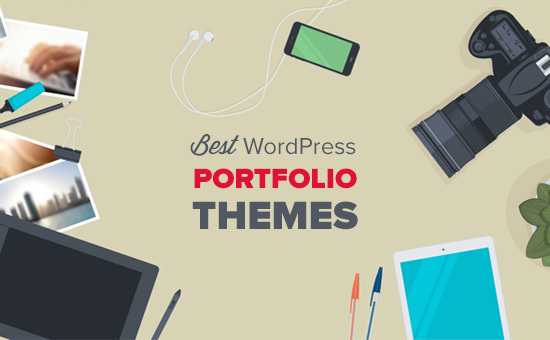 Are you looking for the best WordPress portfolio themes? WordPress is the perfect tool to create beautiful portfolio websites to showcase your work and get new clients. 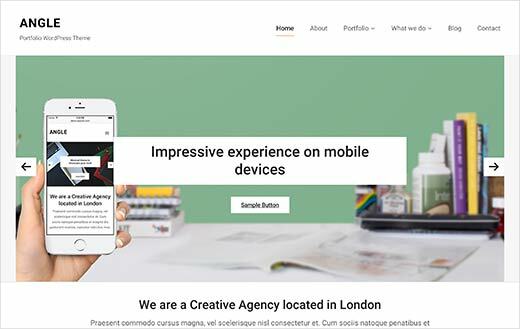 In this article, we will share our expert pick of the best WordPress Portfolio themes, so you can get started the right away. Choosing the right platform for your portfolio website is crucial for the success. Self hosted WordPres.org website gives you the flexibility and freedom to build a website that not only showcases your talents but helps you get more work. To get started, first you will need to sign up for a WordPress hosting account. This is where your website will live on the internet. You will also need a domain name. This will be the address of your website (example: wpbeginner.com or google.com). We recommend that you use either Bluehost or SiteGround. These are one of the largest hosting companies in the world and an official WordPress hosting partner. Once you have signed up for a hosting account, you will need to install WordPress. Follow the instructions in our step by step guide on how to start a WordPress blog and you will be up and running in no time. After installing WordPress you will be able to select a theme for your website. You can pick any theme from our expert selection below and then head over to our guide on how to install a WordPress theme to set it up. Having said that, now let’s take a look at the best WordPress portfolio themes currently available in the market. This list contains a selection of both free and premium WordPress themes and all of them are fully mobile-responsive. 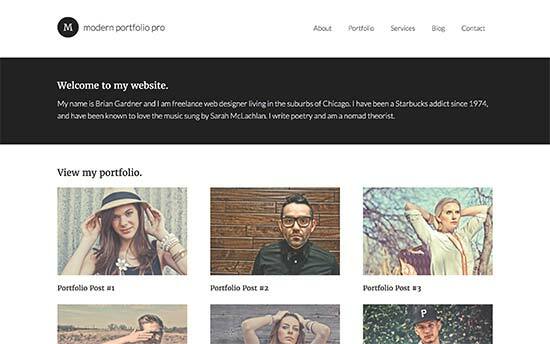 Modern Portfolio Pro is an elegant WordPress portfolio theme from StudioPress. It is built on top of the rock solid core of Genesis theme framework. Modern Portfolio features a minimalist layout with focus on beautiful display of your images and photos. It has with multiple page layouts for blog, homepage, landing pages, etc. 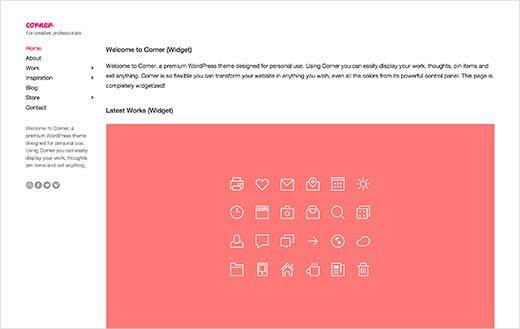 It is easy to setup using the live theme customizer. The homepage is made of widget ready areas allowing you to drag and drop items on your homepage. 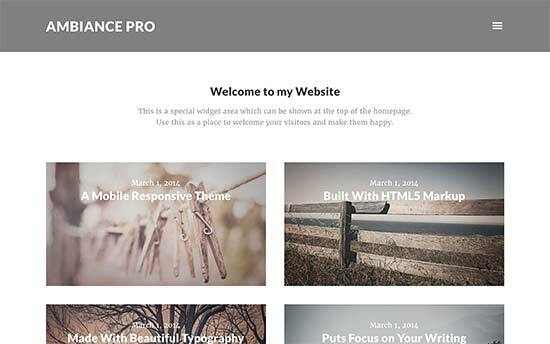 Ambiance Pro is a WordPress portfolio theme built on Genesis framework. Designed specifically to beautifully showcase your photos and images, Ambiance Pro comes with beautiful layout choices and elegant typography. It comes with multiple page templates for your blog, archives, and landing pages. It is quick and easy to setup using the live theme customizer. It has two navigation menus one at the top and the other one at the bottom. The homepage is fully widgetized so you can easily set it up in minutes. 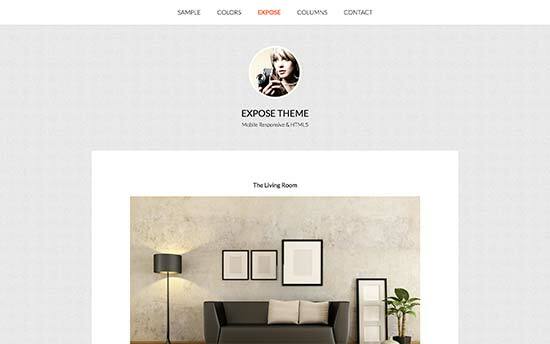 Expose Pro is another elegant and stylish WordPress portfolio theme by StudioPress. It comes with a widgetized homepage with four widget areas and has multiple templates for your blog, homepage, archive, and landing pages. Expose Pro is designed to beautifully showcase your photography. It uses large image display and has a custom gallery post format with lightbox display of your photos. It is quick and easy to set up and is highly optimized for speed and performance. 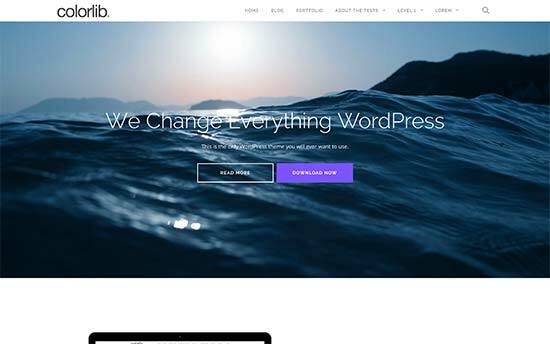 Candid is a stunningly beautiful WordPress multi-purpose theme with a minimalist style portfolio section baked in. If you want to showcase different kind of multi-media in a storytelling format, then you’d like Candid. It comes in a beautiful grid based two column layout for the homepage. It beautifully displays featured images, videos, and uses crisp typography that looks great on all devices. 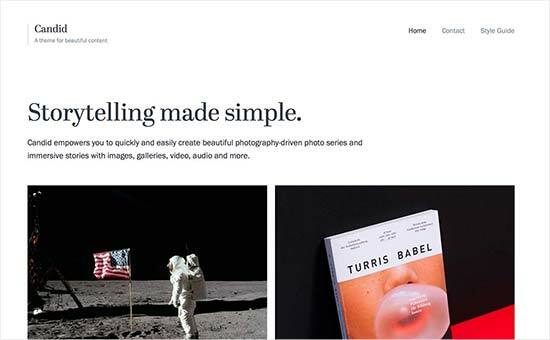 As the name suggests, Camera is a gorgeous WordPress portfolio theme for photographers, illustrators, and visual artists. It focuses on a stunningly beautiful display of large images with elegant typography that allows you to add rich storytelling element to your images. It features a distraction free layout with collapsible menu and sidebar. It is easy to setup and avoids confusing users with complicated options. It comes with a built-in getting started dashboard that will help you set up the theme in minutes. Designer is a beautiful WordPress portfolio theme for designers, artists, photographers, and storytellers. It uses a beautiful grid-based two column layout on the homepage and comes with a beautiful portfolio display. It focuses on making sure that your images pop out and no other design elements distracts users away. It has collapsible menu and sidebar and comes with getting started dashboard to help you get started. 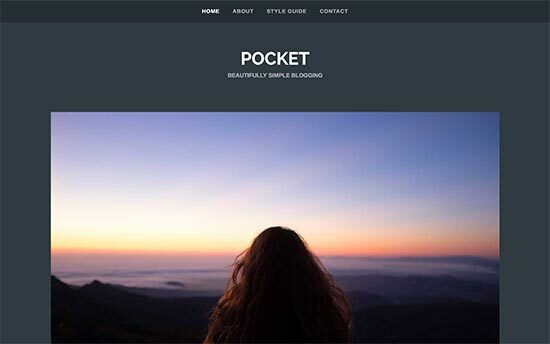 Pocket is a minimalist photography and portfolio WordPress theme. It features gorgeous typography and large display of features images and headers. There are no sidebars except for the one widget ready area at the bottom. It comes with one navigation menu at the top and a social media links menu at the bottom. Due to its super-minimalist approach to design, Pocket is very easy to set up and is highly optimized for speed and performance. 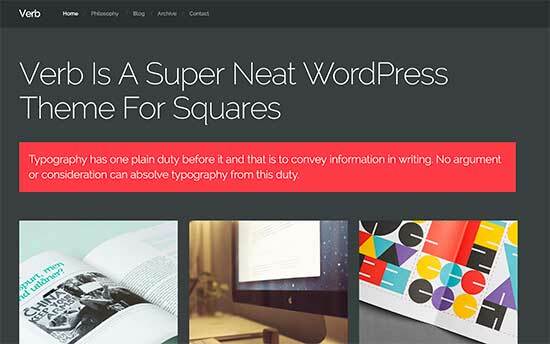 North is another awesome WordPress portfolio theme with a grid based layout. It comes with beautiful portfolio templates to beautifully display images, photos, videos, and audio files. 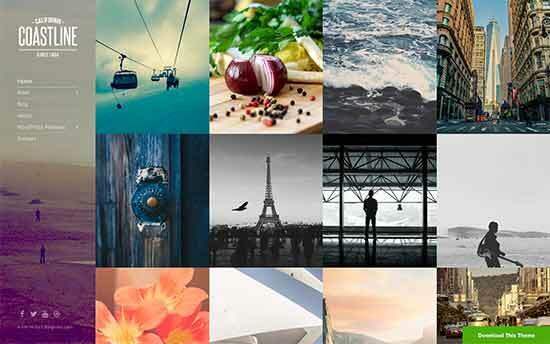 It comes with multiple color choices, supports posts formats, and can be used with third party gallery plugins to create beautiful photo galleries. Peak is a modern WordPress portfolio theme featuring a tile based display of images in a responsive grid layout. It comes with multiple layouts for pages as well as posts. It features a mega menu on top, social media menu, and slide-in sidebar widgets. Aesthetic is a stylish WordPress portfolio theme suitable for photographers, stylists, designers, etc. It comes with a built-in portfolio section, multiple layout choices, and unlimited colors. It also comes with multiple sidebars and a drag and drop page builder. It also fully supports WooCommerce and can be used to run your own online store. 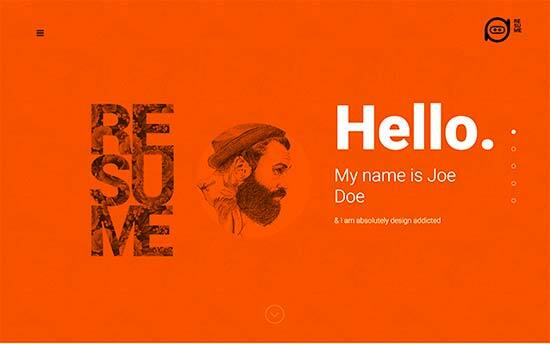 Resume is a bold WordPress portfolio theme. It comes with a built-in portfolio management area, custom widgets, and a drag and drop homepage builder. It can also be used as a single page theme where all your website sections are displayed on the homepage. 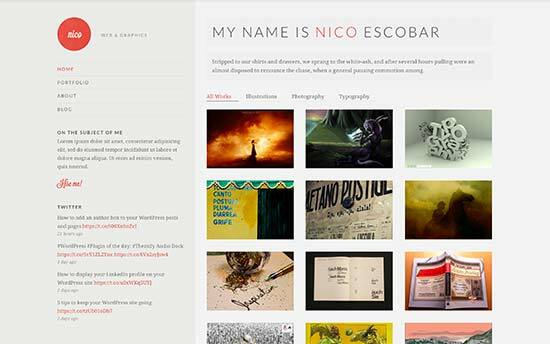 Corner is a minimalist style WordPress portfolio theme for artists, designers and photographers. It comes with a built-in portfolio management area and custom widgets for Twitter and Flickr. It has multiple page layouts and you can choose your own colors. It supports WooCommerce and is tested with popular WordPress page builder plugins. 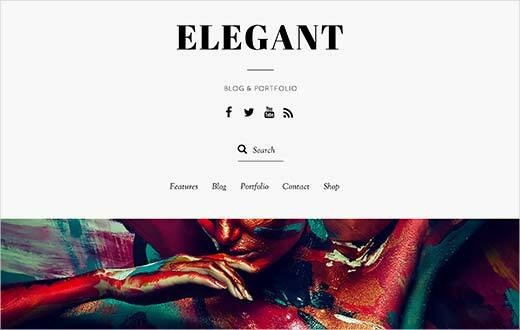 Elegant is a powerful WordPress theme for portfolios. It comes with a built-in portfolio management area and comes with multiple grid and column based layouts. It also comes with image filters that you can apply to your photos after uploading them. The theme comes with its own drag and drop page builder with several built-in templates to quickly create different kind of landing pages. It features gorgeous typography and comes with several custom widgets. Angle is a flexible WordPress multi-purpose theme with portfolio section. It comes with a drag and drop page builder, multiple layout options, and several custom widgets. It is designed to be suitable for portfolio, blogging, photography, and even as a business website. It is easy to set up and optimized for speed and SEO. Coastline is a uniquely beautiful WordPress portfolio theme. It comes with portfolio content type, powerful custom widgets, and multiple layout choices. It features a fixed left sidebar with custom background support and comes with different page templates for blog, portfolio, archives, and galleries. 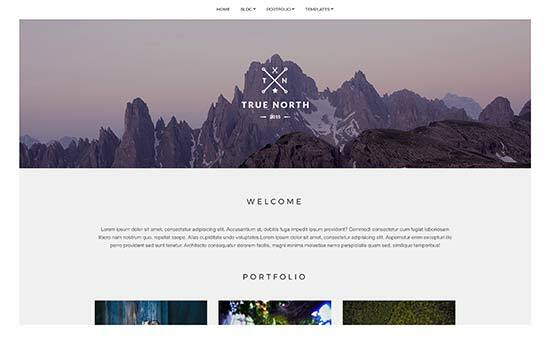 True North is a flexible WordPress portfolio theme with a beautiful design. It comes with multiple layout choices and built-in portfolio section. It features grid based layout on the home page with beautiful display of images. True North supports custom background, custom header, and comes with several custom widgets for social media. 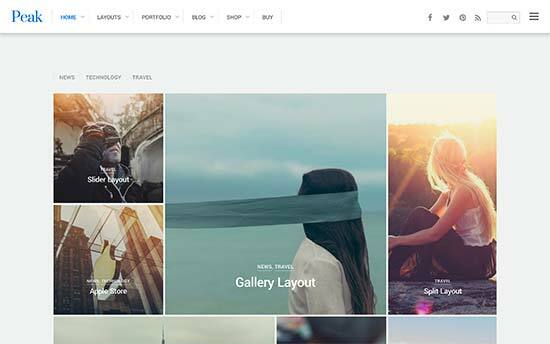 Memories is a beautiful WordPress photography theme with elegant display of your portfolio items. 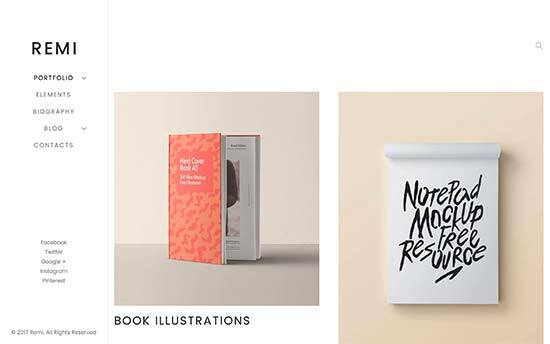 It does not have a portfolio content type, instead it comes with a gallery display that showcases your photographs, designs, and other visual artworks beautifully. The theme comes with multiple color schemes and has multiple layout choices. It comes with custom background and header support as well as custom widgets for your social media profiles. 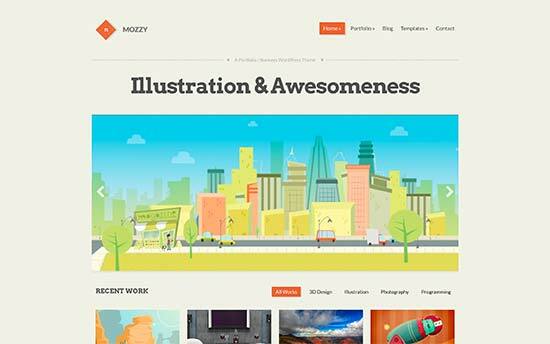 Mozzy is a bright WordPress portfolio theme for illustrators, graphic designers, photographers, etc. It features a customizable homepage with slider and featured content areas. 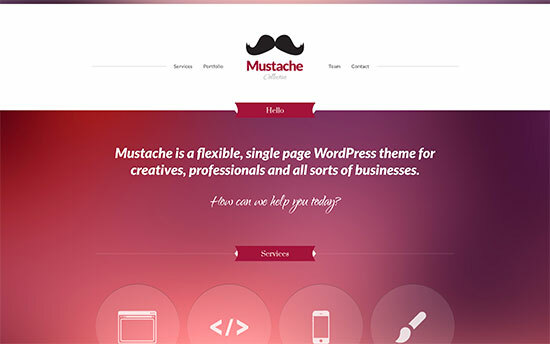 Mustache is a single page WordPress portfolio theme for designers, artists, photographers, etc. It is flexible to be used as a onepage theme or a multi-page theme. It comes with built-in portfolio, clients, services, and team members content types. Mustache features a gorgeous and truly unique design with custom logo support. It comes with Google Maps and contact form support as well. 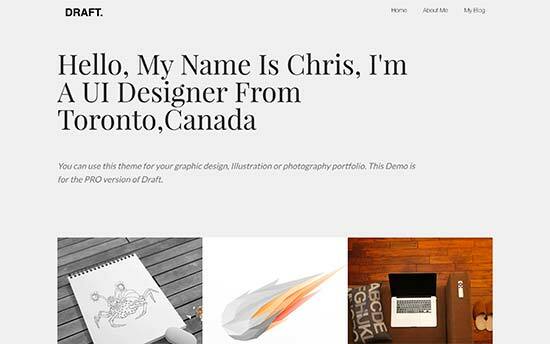 Draft is a minimalist style free WordPress portfolio theme. 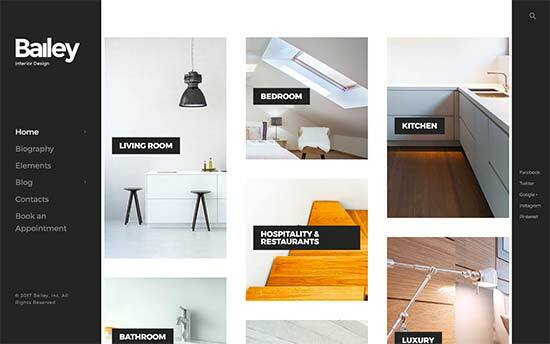 It uses featured images to display a grid based layout on the homepage. Ideal for photographers to showcase their work. It supports theme customization using live customizer and comes with a single navigation menu on top. 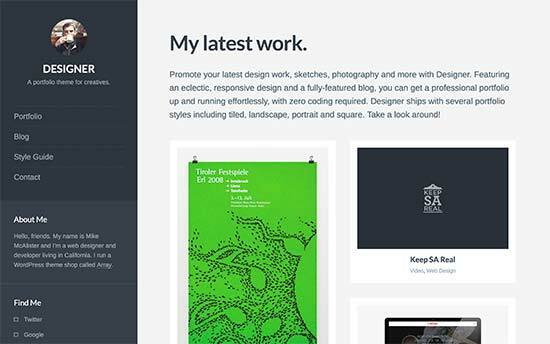 Shapely is a highly customizable free WordPress portfolio theme. It is designed to be flexible enough for single page websites as well as multi-page sites. 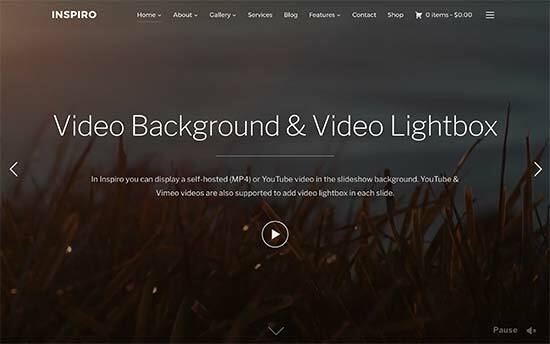 It features a beautiful display of featured images and comes with large custom header support. It has a fully widgetized homepage where you can just drag and drop widgets to add portfolio, testimonials, and parallax sections. 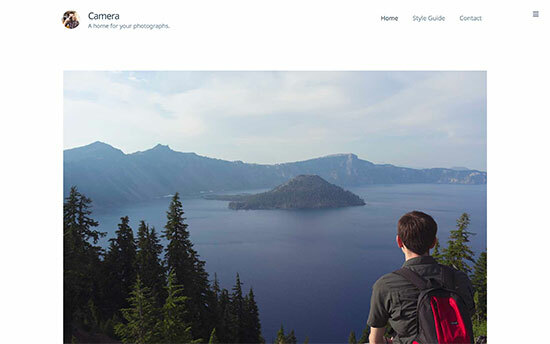 Nikkon is a free WordPress photography and portfolio theme. 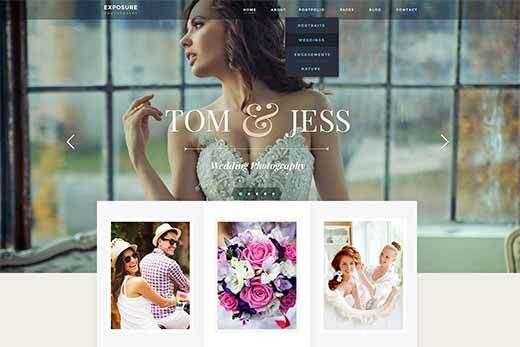 It is designed to beautifully showcase images in a grid based layout on the homepage. It offers multiple header layouts, footer layouts and multiple page templates. It supports WooCommerce out of the box and comes with easy customization options. 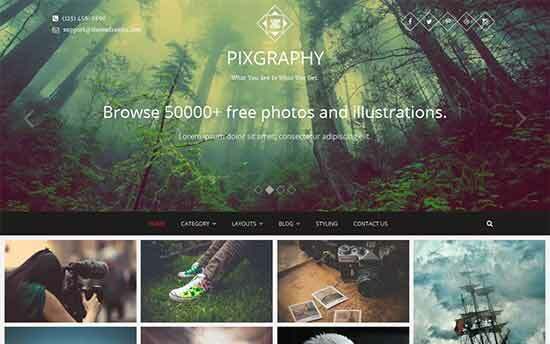 Pixgraphy is an elegant and free WordPress portfolio theme. The homepage features a large header image or custom slider with a grid based layout using featured images. It supports many popular free plugins out of the box and is fully compatible with Polylang plugin to build multilingual websites. 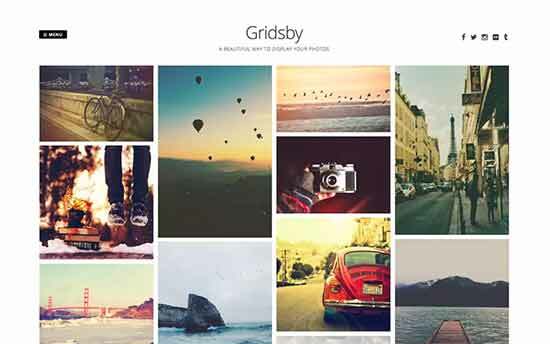 Gridsby is a free Pinterest style WordPress portfolio theme designed specifically for photographers, curators, artists, etc. 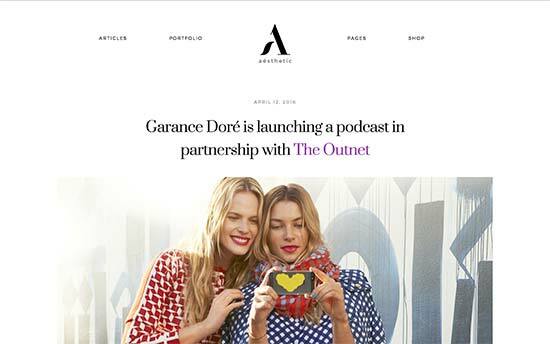 The homepage is built using featured images from blog posts in a beautiful grid based layout. It also uses homepage gallery as a feature to showcase your photos on the homepage. Bailey is a flexible WordPress portfolio theme for interior designers, photographers, and other creative types. It comes with a built-in section for projects allowing you to easily add portfolio items with full details and images. The theme supports multiple page layouts with multiple sidebar options. It also comes with several ready to use custom widgets for social media, simple slider, and featured content slider. 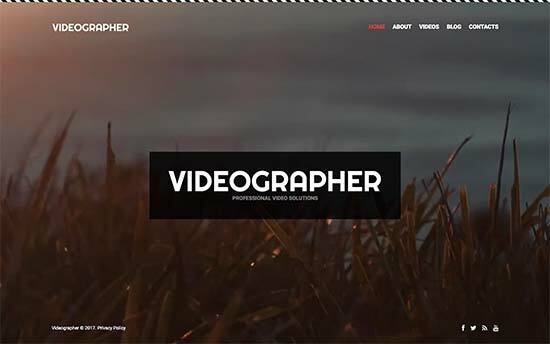 As the name suggests, Videographer is a WordPress portfolio theme for video producers, filmmakers, and photographers. It features a large fullscreen header video section on the homepage. It comes with a drag and drop page editor, tons of shortcodes, and several ready-to-use custom widgets. Videographer also offers page templates, with multiple sidebar options. It comes with different color schemes and it is very easy to setup. Remi is another beautiful WordPress portfolio and photography theme. It comes with built in content type to add and manage your projects and portfolio items. It comes with multiple layout options and several custom widgets. It comes with Google Maps and Google fonts support and can be easily customized using live customizer. 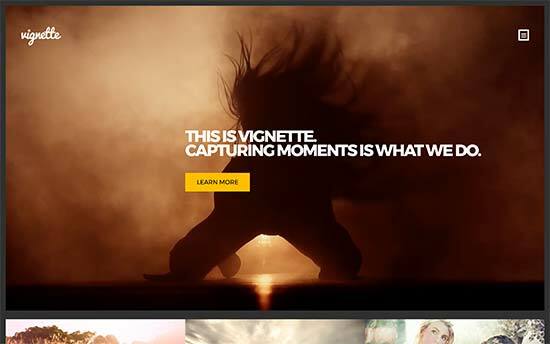 Inspiro is a beautiful multi-purpose WordPress theme which is ideal for video portfolio websites. It comes with beautiful fullscreen video backgrounds, a powerful portfolio section, lightbox popup, and a gallery module. It has unique custom widgets to display portfolio showcases. It includes four unique templates and a drag and drop page builder. The video lightbox feature allows users to watch videos in a popup for a more immersive user experience. 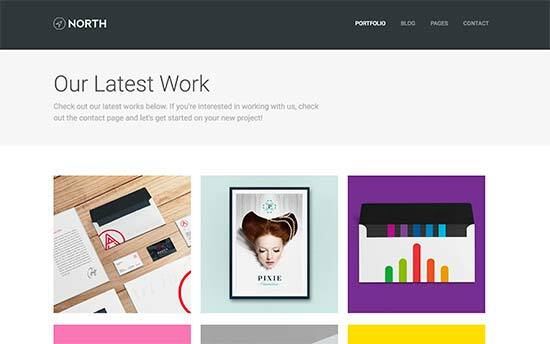 We hope this article helped you find the perfect WordPress theme for portfolio websites. You may also want to see our complete step by step WordPress SEO guide for beginners. This is an awesome list. 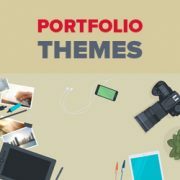 Thanks for making it easier to find the perfect portfolio for us creatives. I know you probably hear from a ton of theme creators, so I’ll keep this short. I’m actually building my own theme, solely made for designers, and I would love to get your feedback on it. Would you mind if I send you the link? Many themes listed here will not be available to WordPress.com users. Please see our guide on the difference between self hosted WordPress.org vs free WordPress.com blog.